"The feedback has been over the top positive, the kids and coaches can NOT get over the new buses. Just wanted to thank you again for the peace of mind that comes with traveling with Brilliant!" "I’m simply raving to everyone about how accommodating you are… especially at 5:30am. Thank you for making our event easier!" Ideal for corporate events, luxury weddings, and guided tours - the Brilliant 28 Passenger Minibus is the perfect way to travel in groups larger than 14. 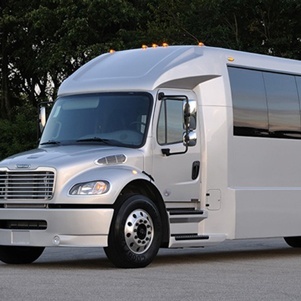 We realized the need for a vehicle that has the same comforts and amenities as our custom Mercedes Sprinter Vans, but allows large groups to travel together. We also addressed the road distractions that are prevalent in New York City by adding a custom suspension for your enjoyment. The main goal with this minibus and all of our vehicles is to provide you with an experience while traveling. If you plan on traveling long distances, we recommend the 36 Passenger Minibus which is equipped with an on-board lavatory. Brilliant's luxury chauffeured service with customized minibuses create an unforgettable experience. The Brilliant 28 Passenger Minibus allows large groups of 28 to experience a Brilliant way of travel together.